﻿ Why’s my Gixer overheating? 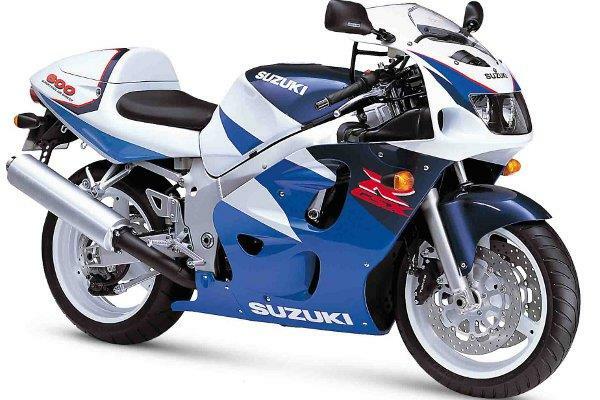 My 1997 Suzuki GSX-R600 is overheating. After a 45-minute ride the temperature had risen to around 125°C. Since then I have had the radiator drained, flushed and filled with new coolant. I have had the thermostat out as well and tested it and it seems to open fine. I’ve had it idling for around 30-45 minutes and the temperature reached 110°C when the fan kicked in and dropped it to 106°C. The fan should kick in at 106°C and cut out when the temperature drops to 99°C so it sounds like the temperature sensor for the fan switch is coming in too late. It could also be that the wires for the power feed to the radiator have been switched accidentally so the fan is running in reverse and sucking hot air from the engine forwards. The easiest way to check it is running in the right direction is to get the bike warmed up to start it spinning, then hold a sheet of paper against the rad. It should be sucked onto the fins, not blown forward.